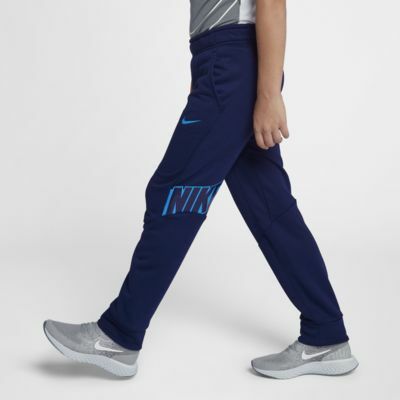 The Nike Dri-FIT Big Kids' (Boys') Training Pants are made with sweat-wicking fabric to help keep you dry and comfortable while you work out. The slim fit tapers at your ankles to stay out of the way while you play. The Nike Dri-FIT Big Kids&apos; (Boys&apos;) Training Pants are made with sweat-wicking fabric to help keep you dry and comfortable while you work out. The slim fit tapers at your ankles to stay out of the way while you play. My SonLove them!!!! Go to hibbits and get these, you wont be sorry. I bought a pair for 3 of my grandsons, all play soccer and all LOVED these pants! Fit well ,look great and will be used a great deal !